How bullish and bearish forces align for stock indexes, forex and other global markets, both technical and fundamental outlooks, likely top market movers. Despite all the headlines, neither economic data nor the Russian invasion of Ukraine moved markets. Here’s what did. –Technical Outlook: European stocks rise, close gap with US, Asia, despite miserable data, Russian invasion of Ukraine. Guess Why? –Fundamental Outlook: The only market driver that really matters, how long the bull market can last, why, and what to monitor. –The Key Questions: What to ask for the coming week and beyond. Broke or are close to breaking their 2 month old downtrend lines. Moved firmly into their double Bollinger® band neutral zones, signaling a bottoming is in as momentum is now firmly neutral rather than negative. So if everything is getting worse why did European stocks rise? For the same reason they’ve advanced in other regions in the face of sustained periods of bad fundamentals. It’s another week of the “bad news equals good news trade.” For those somehow still unfamiliar with this phenomenon, it means that because bad news implies more central bank stimulus is coming, stocks rise because that new cash injection into markets is expected to prop up stock prices. Consistently bad economic data showing stagnant or declining growth. Check. Investors interpret central bank comments to mean that they will add new stimulus programs if things don’t turn around soon, or that such programs are already in the pipeline and that it’s just a matter of weeks before they’re announced. Check, ever since Draghi’s impromptu Jackson Hole comments in which he admitted that deflation was not merely temporary but rather a longer term problem. 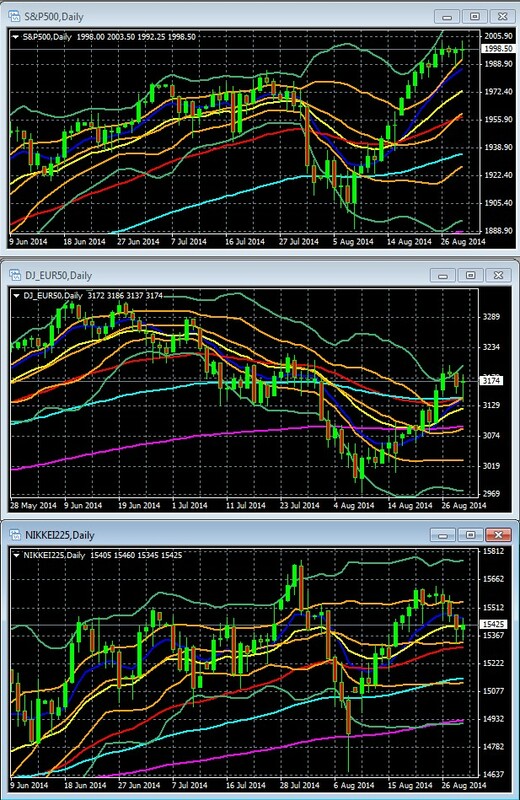 Key For S&P 500, DJ EUR 50, Nikkei 225 Daily Chart June 9 2014 to August 29 2014: 10 Week EMA Dark Blue, 20 WEEK EMA Yellow, 50 WEEK EMA Red, 100 WEEK EMA Light Blue, 200 WEEK EMA Violet, DOUBLE BOLLINGER BANDS: Normal 2 Standard Deviations Green, 1 Standard Deviation Orange. For the US and Europe, the big gains came early in the week on rising hopes for new ECB stimulus, fueled by ECB President Draghi’s remarks that deflationary forces were proving more persistent than previously thought. For the rest of the week, global stocks stayed in flat, tight trading ranges. The big lesson here is that speculation on ECB easing was the big market mover, overriding data as well as news of Russia’s increasingly overt invasion of Ukraine. On Saturday Reuters reported that ECB Executive Board member Benoit Coeure had reinforced new ECB easing expectations, saying the bank was prepared to further boost funding to banks in order to encourage lending. This alone could give global indexes, particularly European ones, a boost early in the week. It also puts added focus on Thursday’s ECB meeting and press conference. Although most analysts don’t expect the ECB to announce new measures yet, this event would still be the likely venue for the ECB to feed or dampen stimulus speculation. Together all of these indicate fading momentum in the Eurozone’s largest economy. The cause isn’t the Russian/Ukraine conflict, because even if there were material sanctions in effect, Russian exports represent only 1% of German GDP. Instead, the problem for Germany and most of the EU is restrictive fiscal policy, that is, not enough spending. Low inflation is remains a problem but Friday’s increase in core CPI growth could give Mario Draghi enough reason to leave monetary policy unchanged at this week’s ECB event. With the first TLTRO program expected in September, (and old LTRO loan repayments minimizing any net addition of liquidity until November or December), the central bank would probably prefer to see how the new TLTRO works before increasing stimulus further. -The ECB could announce ABS purchases, with the actual dates and details to follow later. -It could lower its GDP and inflation forecasts, both of which are due out next week. -It can simply continue with more of its usual statements of concern about EU stagnation and its willingness to do more to help, though there is cause to wonder if its ammunition is running low. —Encouraging lending helps only if there is actual demand for loans. That in turn requires optimism about the future. Business need to believe expansion is coming, and households need to have confidence in that their incomes will be stable and growing. However GDP continues to stagnate and most member states need to cut spending (another GDP drag) if they’re to keep up with EU mandated debt/GDP reductions. In other words, the ECB alone cannot do enough to make up for a lack of economic reforms in the EU. Economic data from the US, Europe, or China (ok, occasionally Japan or the UK). Speculation about changes in policy, and ultimately, benchmark interest rates, from one of their central banks. Geopolitical tensions, with the Russia/Ukraine conflict the only one seen as having potential to really hurt the global economy, mostly through the damage it does to the already shaky EU. Mideast turmoil hasn’t affected energy prices and the “China versus all of its neighbors” tensions remain on slow simmer, so both remain irrelevant for investors. Looking at last week’s price action in global equities, one big screaming lesson stands out that everyone needs to learn. Speculation on major central bank policy changes, particularly from the ECB, Fed, and PBoC, (and thus key data most likely to influence them) is overriding all else. 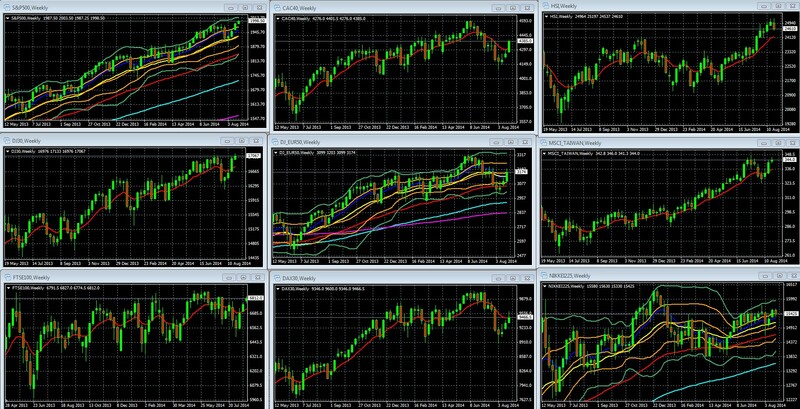 Last week’s data should have global indexes, at very least in Europe. Ditto Russia’s now overt direct invasion of Ukraine. Yet the only thing that moved most global indexes was rising speculation of new ECB easing. This isn’t so surprising. Last week’s data merely confirmed and supported the current outlook for the major economies. New economic sanctions against Russia appear to be coming, but the West remains vague on both their timing and extent. So markets have reason to doubt if and when these will materially impact anything. Thursday’s ECB meeting, rate statement and press conference. As noted above, while we don’t expect new policy to be announced, at least not in any meaningful detail, it’s quite possible that the ECB will want to at offer something that suggests it’s taking an active role in solving the mess that EU leaders have failed to resolve. The ECB meeting has the most market moving potential of any event on the calendar, because its policy is in flux. It will ease further, the only question is when and how. That means a big surprise here could move markets more because it could change expectations about ECB policy, EU liquidity, the Euro, interest rates, etc. the most. The Fed continues to see too much slack in the labor market to allow for any material tightening beyond a minor rate increase sometime in the coming year, so the US August job reports have the most potential of any other calendar event to influence speculation on the pace and scope of Fed tightening. Unless this one really surprises and the ECB meeting does not, this has a bit less market moving potential because Fed tightening is happening more slowly than ECB easing. Therefore no matter what the result from the jobs reports, it’s less likely that these will move expectations on policy changes as much as a surprise from the ECB meeting. Also, the ECB meeting will produce comments directly from the ECB itself, whereas the US jobs reports not as telling as a direct communication from the Fed itself. The ADP non-farms payrolls report, a privately compiled version of the official report. ADP changed its methodology back in October 2012 in an effort to make the ADP report better predict the actual official BLS version. The ADP version continues to be a good indicator of general direction, but less effective in predicting the actual result. See here for details. Still, positive or negative surprises have been influential in the past, at least for the two days between the ADP report and official NFP release. See below for other calendar events that could influence most global asset markets. Events that would influence a narrow range of assets or only regional indexes are omitted, so this summary would not be suitable for those dealing with currencies or bonds which tend to be more influenced by country or region specific news. For example, we omit most Bank of Japan or England events, although these would be of importance to investors in JPY or GBP currency pairs or those bond markets. How Much Longer Will The Bull Market In Equities Last? The short answer, obviously, is that few see signs that it will end any time soon, except for the perma-bears. That said, by definition, crashes are unanticipated by almost everyone. The most compelling piece on the bullish side was Cullen Roche’s summary of David Rosenberg’s bullish forecast here, mostly because not only does Rosenberg focus on data that isn’t as likely to be distorted by the prevailing unique levels of central bank intervention and low rates (unlike analyses based on historical valuation metrics), he’s also a converted bear. That willingness to admit fault and stick to what the data tells him earns credibility. Bursting bubbles in capex (as in 2000) or consumption (2007-8) or when monetary policy is too tight, that is, well above its neutral level of about 3.75% on the US 10 year treasury note. He notes, similar to what we’ve said in the past, that with the Fed planning on a very gradual rate of increase, that could take about 5 years. Agree or not, that HAS been the reality of the bull market. The only material pullbacks occurred when one of these was in doubt (EU crisis, taper tantrums, etc.). 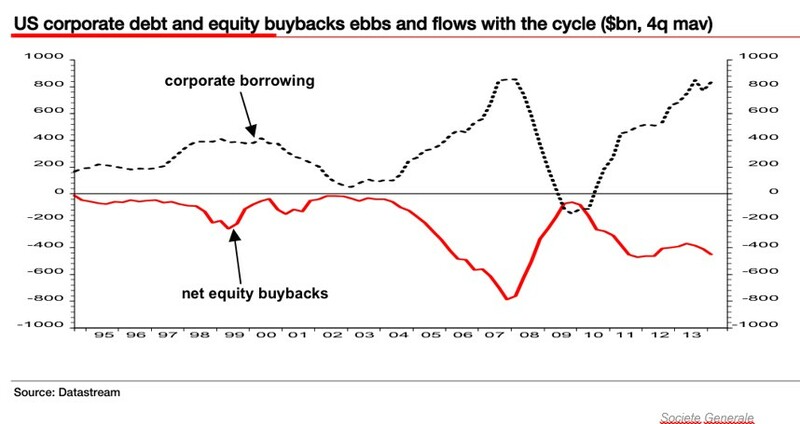 SocGen’s Albert Edwards is arguing that with the end of QE, that will bring the end of the low rates that fund corporate stock buybacks, which he contends are a major prop of stock prices. Below he shows the correlation between corporate borrowing and stock buybacks. The unstated implication is that the buybacks began at the same time as the bull market, which in turn suggests they’re a key component of it. 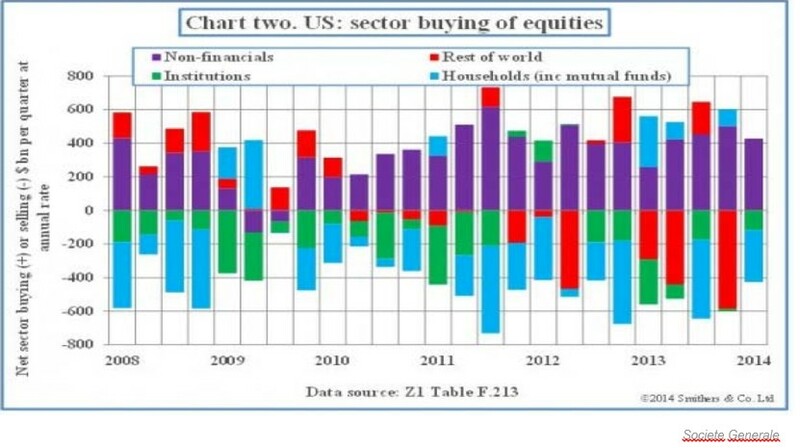 Below he shows the proportion of stock purchases from corporate buybacks, shown by the purple bars. Edwards then asserts that the end of US QE, combined with an anticipated slowing of corporate profits, will end the buybacks and so cut demand, and prices, for stocks. The end of QE doesn’t necessarily bring a material spike in interest rates, particularly when the Bank of Japan and ECB are moving towards further easing. That added liquidity should to some degree compensate for whatever effects come from planned tightening by the Fed and Bank of England. The economies of the EU and Japan, both burdened with low growth and inflation, will cause their central banks to start “major” new QE programs in late 2014 or early 2015. Meanwhile, the slow but steady recoveries in the US and UK will bring their central banks to begin some kind of gradual tightening at some point in 2015. Indeed the latest meeting minutes of both the Fed (two weeks ago) and BoE (last week) suggest show signs that these two banks are edging towards tightening. This has significant implications for many kinds of global markets. 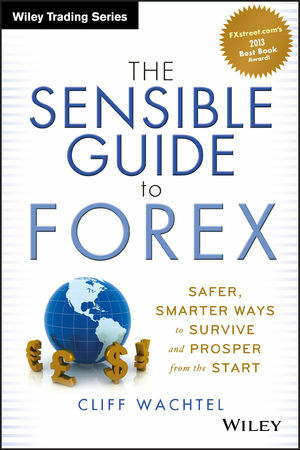 The most obvious effects are being seen, and will continue to be most obvious, in currency markets. Currencies trade in pairs, so literally, everything is relative. That is, even minor but persistent differences in economic performance can create significant long term trends as long as the relative differences continue and continue to give one currency a higher benchmark interest rate than the other. First, will falling rates in the EU and Japan offset the effects of rising rates in the UK and US for global growth, stocks, and emerging market assets? Remember how in early 2014 emerging market assets and currencies were hit hard by the mere hint of coming Fed rate hikes? These would have cut demand and prices for emerging market currencies, stocks and bonds because they would lose some of their yield advantage over US assets. It also forced their bond yields and borrowing costs up, which in turn hurt their growth prospects. Will US And UK Tightening Undermine Easing Policies For The ECB and BoJ? An equally significant question is whether rising rates in the US and UK, or at least the expectation of them, will force global rates higher and undo the very easing that the EU and Japan are trying to accomplish? Remember, bonds operate in a global market. If investors can get higher returns on US and UK bonds from both currency appreciation (currencies rise as their benchmark rates rise) AND higher bond yields, why would they buy EU and Japanese bonds? They wouldn’t, not until EU and Japanese bond prices fell and thus their yields rose enough to compete with bonds of the US and UK. Sure, for a while the ECB and BoJ and just keep buying up their own bonds to keep their bond prices and yields stable. However even if we assume that the ECB would ultimately be allowed to do that (we do, see here for details) along with Japan, that’s not a sustainable policy, as such unrestrained money creation (let’s avoid technical definitions of money printing) risks creating a Weimar-like hyperinflation. Theoretically if the US and UK hike slowly enough, with some kind of policy coordination with the ECB and BoJ, maybe they could avoid that mess. Frankly I lack the background and analytical skills to even attempt an answer. I haven’t even considered the impact of Chinese central bank policy, which could easily revert to easing mode despite intentions to move towards tightening. Do you have any thoughts, dear readers? Other than the above mentioned events, here’s a quick rundown of other potential market movers. China: Manufacturing PMI (official data focused on big state owned firms), HSBC final manufacturing PMI (privately compiled, focused on smaller privately owned firms). Both are relevant for the EURUSD because China’s status as leading global growth engine means top tier reports like these influence overall risk appetite, with which the EURUSD usually moves (albeit not recently given ECB easing, bad EU data, and Russian tensions, all of which are undermining the EUR more than other assets). Will Russia escalate? If so, will the West continue to delay imposing meaningful sanctions and thus allow markets to largely ignore the conflict? Will the ECB September 4 meeting indicate new EUR dilutive easing coming sooner than expected? Will key EU and US top tier data continue with the “US outperforming the EU” theme, and if so, will that raise expectations for faster ECB easing and/or Fed tightening? Again, it’s changes in sentiment on central bank policy direction that move global stocks in general, and the EURUSD in particular, more than anything else these days. Also, Fed policy is no longer viewed as being on automatic pilot after the last FOMC meeting minutes for July suggested that the timing of the first rate hike is under discussion. Will Friday’s US jobs report feed expectations for faster Fed tightening? If so, will US bond rates remain low anyway as safe haven demand keeps rates low. If indeed there is a coming divergence in central bank policies, with the Fed and BoE tightening while the ECB and BoJ are easing, what will be the net effect on global interest rates and markets? Can the ECB, with its limited tools, continue to keep the EU crisis in hibernation, even as so many member states that are too big to bail out run unsustainably high debt levels that are likely to grow worse, as we discussed recently here? ← EURUSD Weekly Outlook: Technical Breakdowns, Fundamental Drivers – Coming “Sell The News” Bounce?